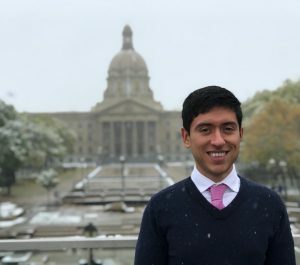 MacEwan University public relations student Luis Carlos Flores Aguilar is the 2018 recipient of the Torchia Scholarship in Public Relations/Communications. The scholarship is awarded by the Communications + Public Relations Foundation to a communications student studying public relations in either French or English, and that is not their first language or mother tongue. Originally from Veracruz, Mexico, Luis Carlos also has a degree in petroleum engineering and a diploma in project management. Luis Carlos first started learning English at a private school in Mexico, but knew he needed to learn more when he first arrived in Canada and was taken aback at how quickly everyone spoke. Under a visitor visa at the time, he was not able to study or work, and so would go to the public library to read and attend free English classes, which he continued until his acceptance into the MacEwan University public relations program in September 2017.